ECHOMAP™ Plus 94sv is a combo with some serious connections. 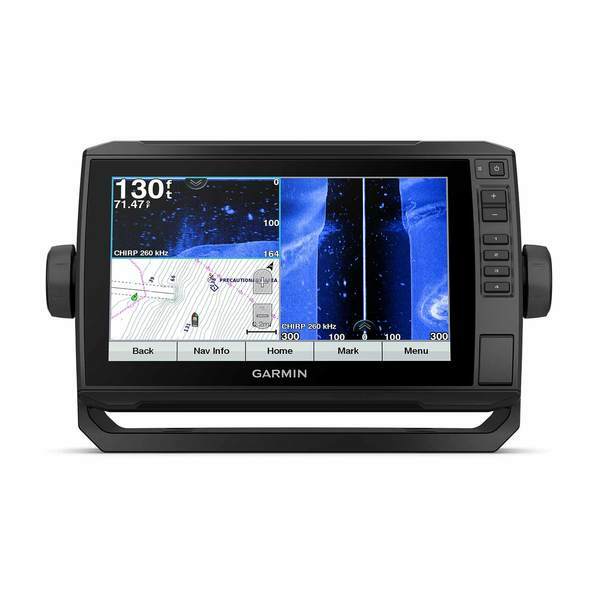 A 9" diagonal touchscreen with keypad-assist for when it's really wet, a transom mount transducer that dials in three kinds of sonar—mid band CHIRP traditional sonar plus CHIRP ClearVü and CHIRP SideVü scanning sonar—with the breakthrough Connected Boat technology of Garmin's ActiveCaptain App. Get connected with ActiveCaptain App: Garmin's free all-in-one ActiveCaptain mobile app allows you to manage your marine experience from nearly anywhere. It creates a simple yet powerful connection between your compatible mobile device and your chartplotter, charts, maps and the community. Use Quickdraw Contours to create your own charts: Instantly create personalized fishing maps on-screen with 1' contours. Tailor them to fit your needs. These are your maps — you own them. Keep the data to yourself, or share it with the Quickdraw Community on Garmin Connect™. SailAssist: SailAssist features include laylines, enhanced wind rose and heading and course-over-ground lines. See true and apparent wind angle and speed as well as set and drift and a glance. for sailboat racers, a pre-race guidance page that shows your virtual starting line along with data fields showing laylines, time to burn before the start and a race timer.